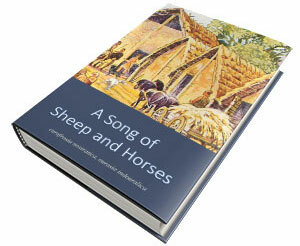 You can read more about it in the article Ancient DNA upends the horse family tree. That none of the domesticates sampled in the last ~4,000 years descend from the horses first herded at Botai entails another major implication. It suggests that during the 3rd Mill BCE at the latest, another unrelated group of horses became the source of all domestic populations that expanded thereafter. This is compatible with two scenarios. 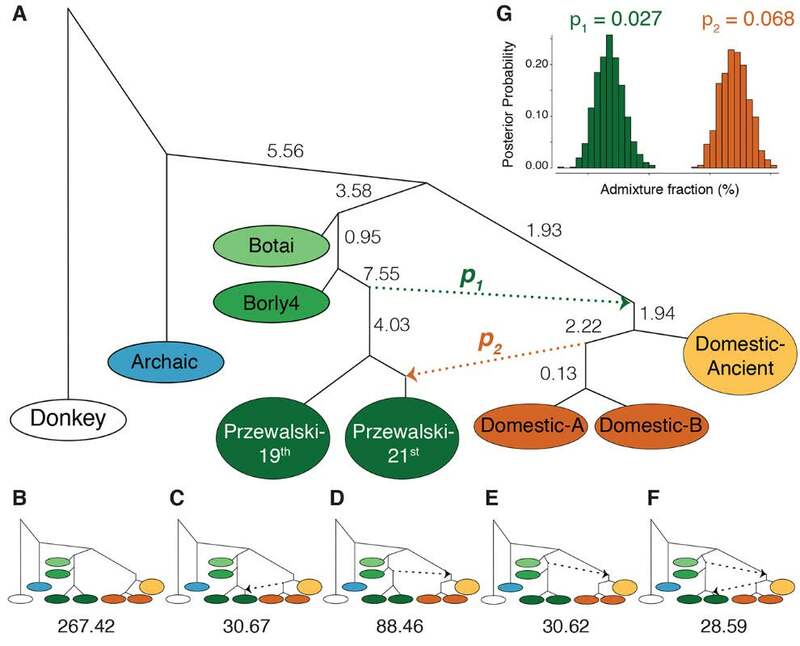 First, Botai-type horses experienced massive introgression capture (22) from a population of wild horses until the Botai ancestry was almost completely replaced. Alternatively, horses were successfully domesticated in a second domestication center and incorporated minute amounts of Botai ancestry during their expansion. We cannot identify the locus of this hypothetic center due to a temporal gap in our dataset throughout the 3rd Mill BCE. 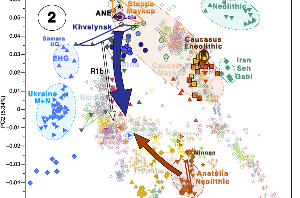 However, that the DOM2 earliest member was excavated in Hungary adds Eastern Europe to other candidates already suggested, including the Pontic-Caspian steppe (2), Eastern Anatolia (23), Iberia (24), Western Iran and the Levant (25). 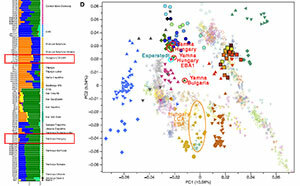 Notwithstanding the process underlying the genomic turnover observed, the clustering of ~4,023-3,574 year-old specimens from Russia, Romania and Georgia within DOM2 suggests that this clade already expanded throughout the steppes and Europe at the transition between the 3rd and 2nd Mill BCE, in line with the demographic expansion at ~4,500 ya recovered in mitochondrial Bayesian Skylines (fig. S14). 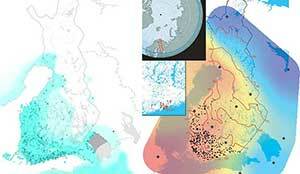 Admixture graphs. (A to F) The six scenarios tested. Panel (A) received decisive Bayes Factor support, as indicated below each corresponding alternative scenario tested. 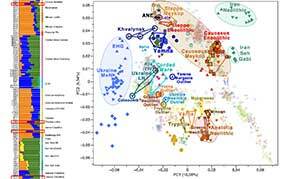 Domestic-Ancient and Domestic-A/B refer to three phylogenetic clusters identified within DOM2 (excluding Duk2): ancient individuals; modern Mongolian, Yakutian (including Tumeski_CGG101397) and Jeju horses, and; all remaining modern breeds. (G) Posterior distributions of admixture proportions along p1 and p2 branches. 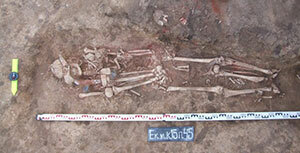 This study shows that the horses exploited by the Botai people later became the feral PH. Early domestication most likely followed the ‘prey pathway’ whereby a hunting relationship was intensified until reaching concern for future progeny through husbandry, exploitation of milk and harnessing (7). 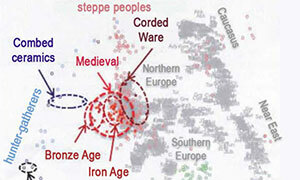 Other horses, however, were the main source of domestic stock over the last ~4,000 years or more. 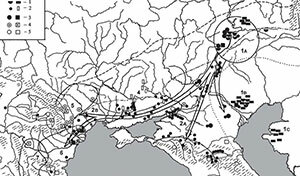 Ancient human genomics (26) has revealed considerable human migrations ~5,000 ya involving “Yamnaya” culture pastoralists of the Pontic-Caspian steppe. 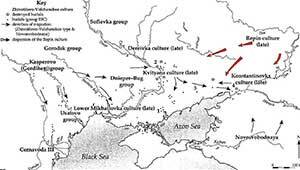 This expansion might be associated with the genomic turnover identified in horses, especially if Botai horses were best suited to localized pastoral activity than to long distance travel and warfare. 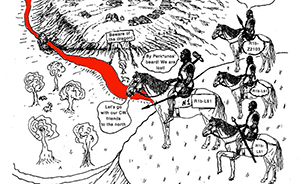 Future work must focus on identifying the main source of the domestic horse stock and investigating how the multiple human cultures managed the available genetic variation to forge the many horse types known in history. We are seing that Bell Beakers were obviously horse riders, and that their horses must have derived from Yamna riders, so it is quite possible that their ancestral early Khvalynsk culture was the origin of domesticated horses, as proposed by David W. Anthony, although for the moment we only know “that [horse] domestication could have been a process with many phases, experiments, failures, and successes”. 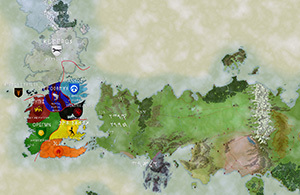 EDIT (23 FEB 2018): My interpretation errors removed, thanks to the comments.